Two Eastern Phoebe Eggs in the nest. I had my suspicions when the mother was roosting on the nest all weekend. Sure enough when I got into work this morning there were two eggs in the nest. Eastern Phoebes lay one egg per day, usually in the morning. This means that one of these eggs was laid this morning (Monday) and one was laid yesterday (Sunday.) Eastern Phoebes typically lay four to five eggs. It should be interesting to watch the nest for the eggs of Brown Headed Cowbirds. This particular nest site was parasitized by cowbirds last year and while walking in to work this morning I could hear cowbirds calling very near this nest. Brown-headed Cowbirds do not make their own nest, rather, they lay their eggs in other birds nests so the other bird will raise their young for them. Last year the Eastern Phoebe must have realized there were too many eggs in the nest because she kicked two eggs out of the nest. Unfortunately, she picked the wrong two eggs and threw out two of her own. 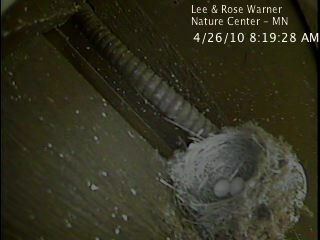 You can also follow our Eastern Phoebe nest on Cornell's NestCam site.